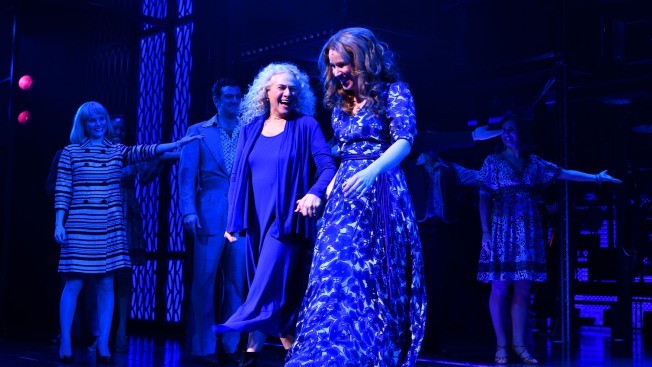 Carole King and Chilina Kennedy greet each other on stage as Carole King surprises Broadway audience as "Beautiful" celebrates Fifth Anniversary at Stephen Sondheim Theatre on January 12, 2019 in New York City. "Beautiful" is based on King's life from when she was a teenage songwriter in New York, to her time as wife, mother and author of scores of recognizable songs. The show features a collection of famous pop music, written by King and her ex-husband Gerry Goffin, as well as Barry Mann and Cynthia Weil, including the classics "You've Got a Friend," ''One Fine Day," ''Up on the Roof," ''You've Lost That Lovin' Feeling" and "Natural Woman." "Beautiful" opened on Broadway on Jan. 13, 2014, and won the 2014 Tony Award for best actress in a musical for Jessie Mueller; the 2015 Grammy Award for best musical theater album; and two 2015 Olivier Awards, Britain's version of the Tonys. Productions have played in London, Japan and Australia and toured the United Kingdom. The North American tour is celebrating its third anniversary of sold-out runs and is currently playing at Philadelphia's Academy of Music.